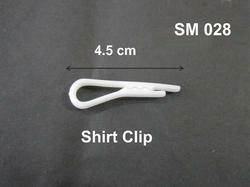 We are manufacturer, exporter and supplier of Shirt Clips. These are used for packing of readymade Shirts. These come in different alloys like brass & stainless steel. These are available to our clients at competitive prices. We have carved a niche amongst the most dominant names in this domain, involved in providing a superior quality range of Shirt Packaging Clip. 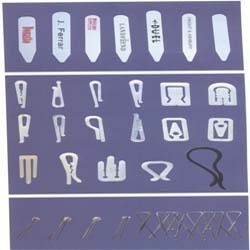 We have highly acknowledged organisation engaged in presenting a remarkable range of Plastic Shirt Clip. Enriched by our vast industrial experience in this business, we are involved in offering an enormous quality range of Silver Brass Shirt Clip. Matching up with the requirements of our clients, we are involved in offering Plastic Packaging Clips. Our organization has successfully expanded its business in market owing to the offered elevated quality range of U Shape Shirt Packaging Plastic Clip.